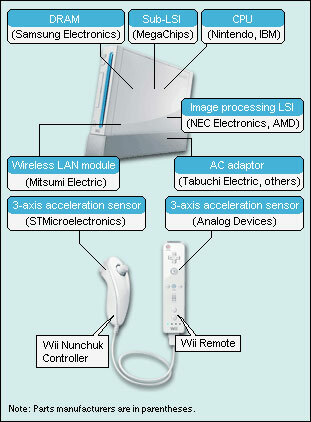 It’s well known that one of the cornerstones of the House That Wii Built is the motion-sensing Wiimote controller; considerably less so that sizable chunks of the funds it generates are flowing to the US and Europe. Italian-French joint venture STMicroelectronics, both of which are expanding on the back of Nintendo’s money-spinner. Analog Devices has just converted one of its facilities into a dedicated Wiimote sensor plant and STMicroelectronics is in the process of throwing up a sensor production line near Milan. The console has impacted the rest of the acceleration sensor industry too – with global sales tripling in 2006 alone, prices are falling and the devices are finding their way into phones and other mobile devices. Other sectors are feeling the Wii effect too – according to Japanese newspaper the Nikkei [Subscription link] Mitsumi Electric, Nintendo’s supplier of power chips and Wi-Fi components netted a fivefold increase in operating profit recently. With Nintendo predicting an 180% Wii sales increase this year, it’s clear to see that the collaborative approach taken by the Kyoto firm spreads the wealth considerably further than Sony’s go-it-solo approach in developing the much-maligned PlayStation 3.